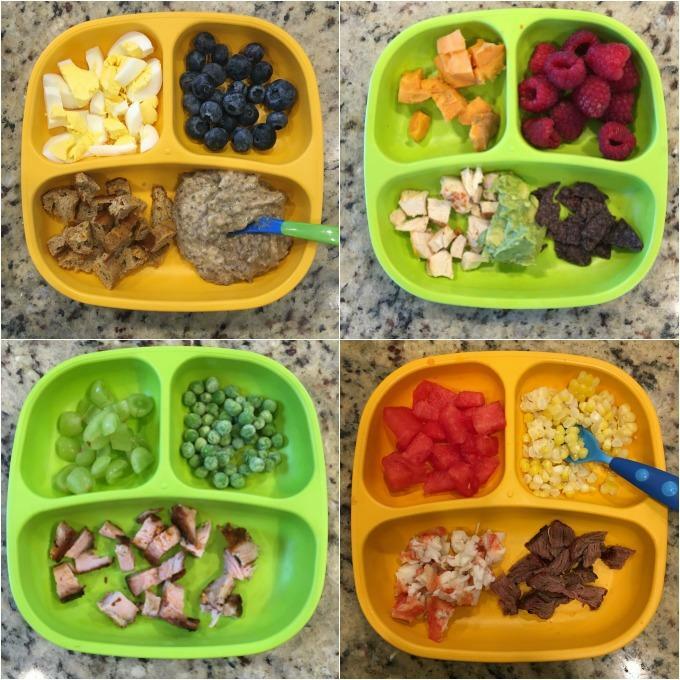 Here are 28 Easy Toddler Meal Ideas from a Registered Dietitian mom. 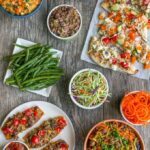 They’re quick, healthy and great for lunch or dinner. 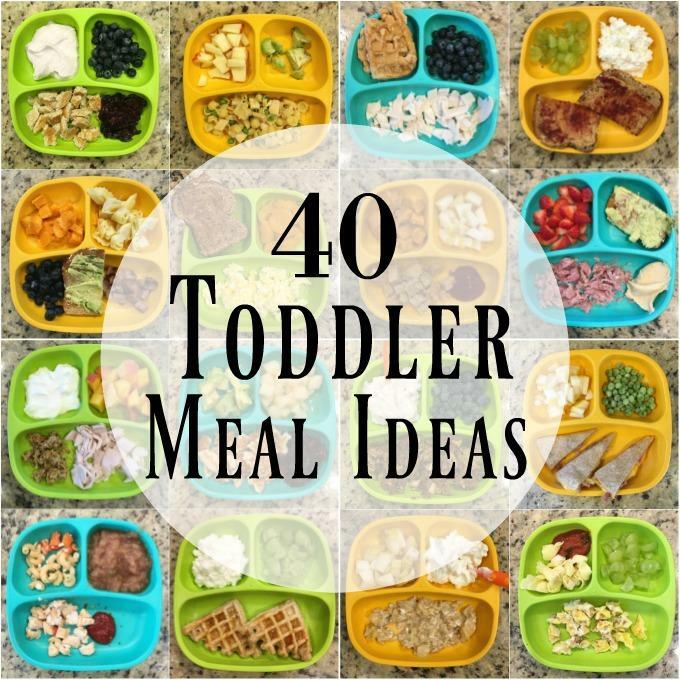 Judging by how many of you downloaded the 50+ Toddler Meal Ideas PDF, I think it’s safe to say there are a lot of parents out there looking for quick, healthy meal ideas for their kids. 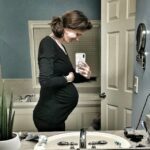 So, I’ve decided to start a monthly series where I share some of the meals I’ve been feeding Squish. First of all, the plates are from Re-Play Recycled. (affiliate link). They’re my favorite and everyone always asks about them! These are mostly lunch and dinner. We’re kinda creatures of habit when it comes to breakfast and he eats yogurt, fruit and either oatmeal or toast with peanut butter pretty much every day. Squish is currently 22 months old and BIG for his age. 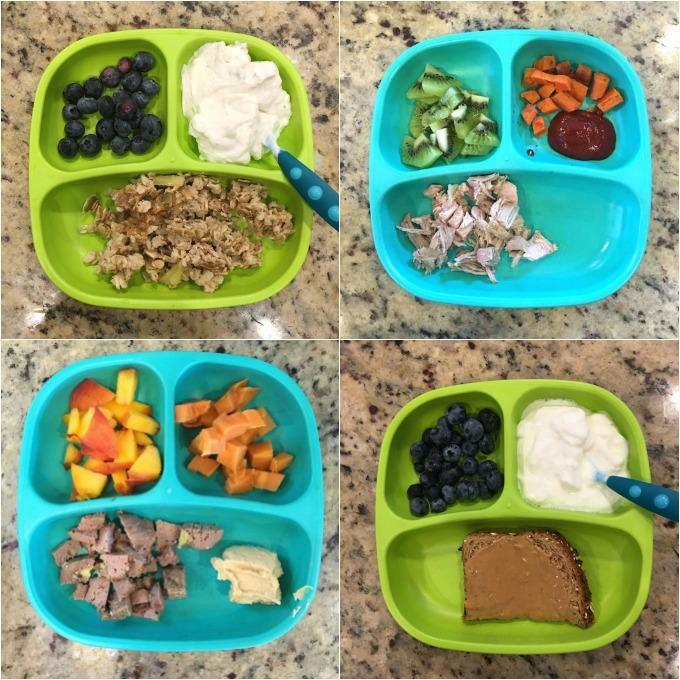 He eats A LOT so if this looks like a lot of food to you, keep in mind it may be more than your child is eating and that’s ok. 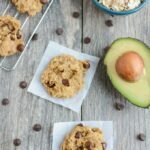 I mentioned in this post about Healthy Fats For Kids that I do my best to include a healthy fat source at most meals…but sometimes I don’t, and that’s ok. I also sometimes forget to include a vegetable. We’re working on it! Like most people, we have our favorite brands. I’ll try to mention some of them in the first picture they show up in. Similarly, if the recipes are on my blog, I’ll link to them! 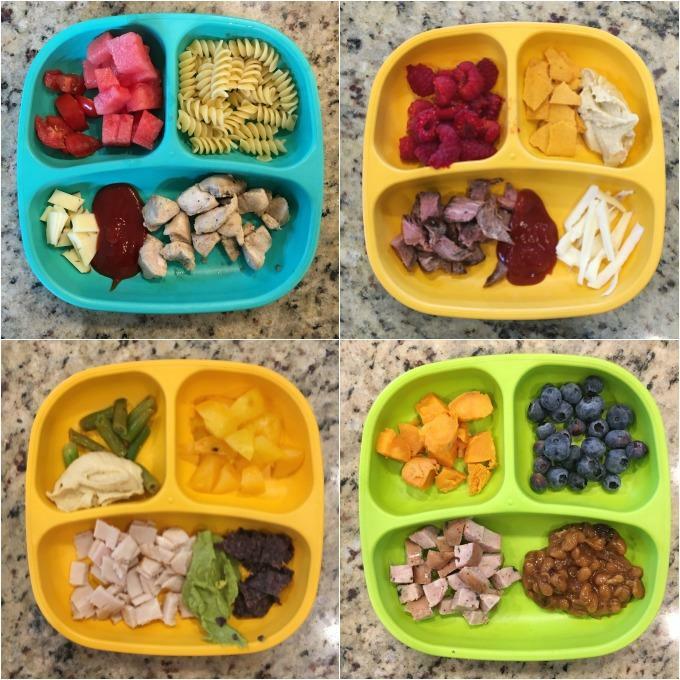 If you’re intersted in my feeding philosophy, you can read about Why My Toddler Doesn’t Always Eat What I Eat. Reminder: the plates are from Re-Play Recycled. (affiliate link) and we love them! 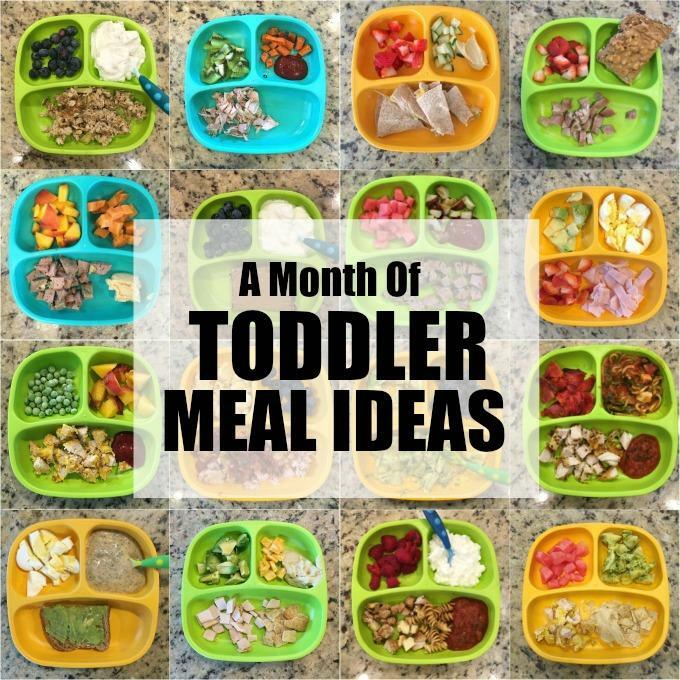 Be sure to pin this post for later when you need some easy toddler meal ideas! 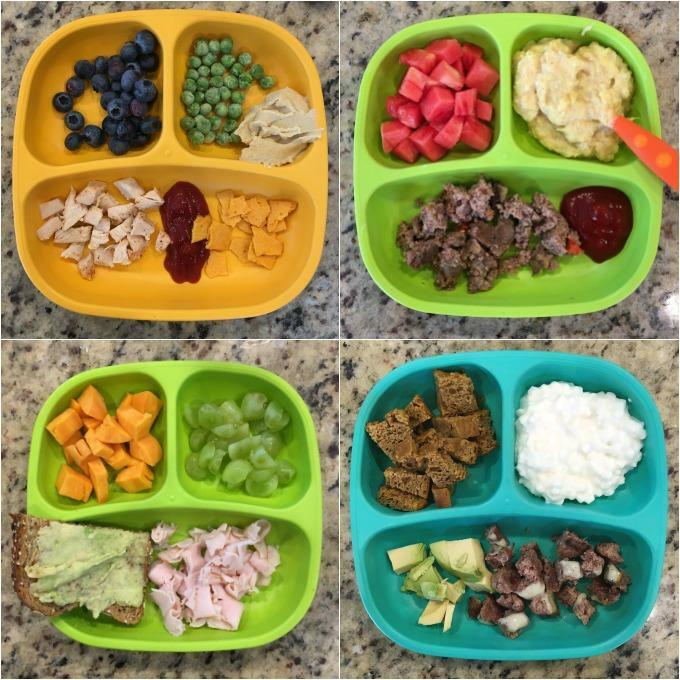 If you liked this post, be sure to check out the follow-up post: 40 Toddler Meal Ideas. PS…the reason a lot of these meals are so easy are because of the food prep I do. 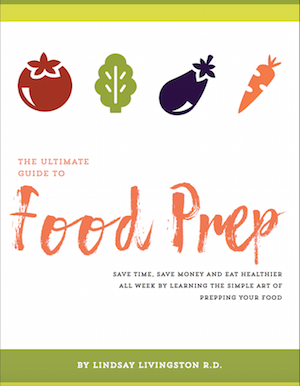 Be sure to check out my Ultimate Guide To Food Prep Ebook if you haven’t already for more tips and tricks! Oh gosh , I can’t THANK you enough for these suggestions. 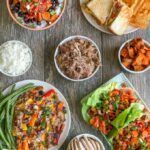 We are in a huge rut and because I find it hard to cook meals for the whole family all at once I am running out options! Can’t wait to try each one of these, going to make meal prep that much easier! Thank you thank you thank you! These suggestions are one word, AMAZING! I have a two year old that is very picky eater. Pretty sure he will love a few of these. Where did you get these sectional plates? This is so awesome! 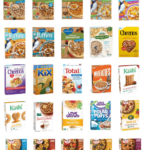 I am not the healthiest of people (though I’ve been trying to become more healthy) so I am really nervous about what I should be feeding my son to make sure he’s getting what he needs and the right amount. 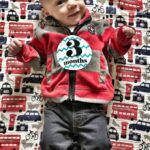 Luckily, he’s only 3 months right now so i still have some time to worry about it but this provides me with a great starting point with these meal ideas! Thank you so much for sharing! thank you thank you thank you ! 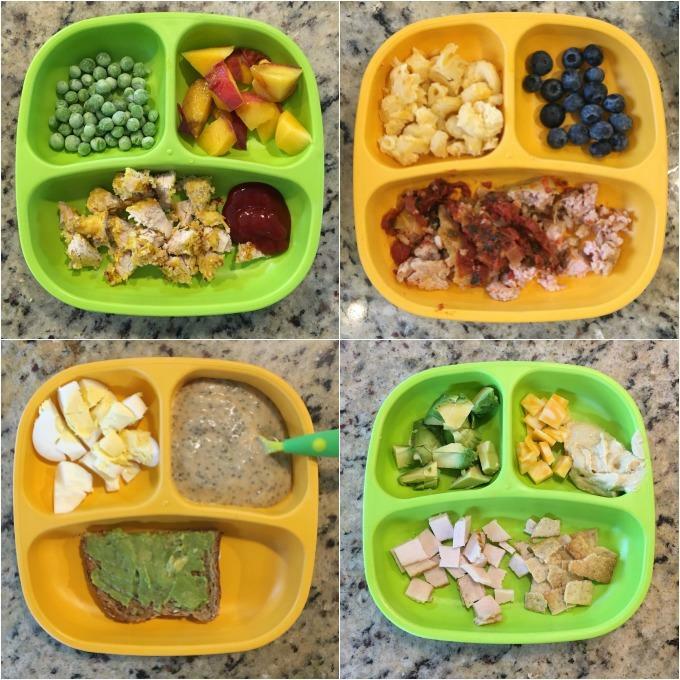 Healthiest and most balanced meals for toddlers I’ve seen, this will be huge inspiration right now that i’ve been in a cooking funk. I noticed you give sweet potatoes and butter nut squash, how do you cook them for toddlers? i usually just poke some holes in the sweet potatoes and microwave them for 5-6 minutes. For the squash I cut in half, drizzle with oil and roast at 425 for 20 minutes or so….then scoop it out, mash it and usually mix with some plain yogurt and a little maple syrup and cinnamon. Hello! 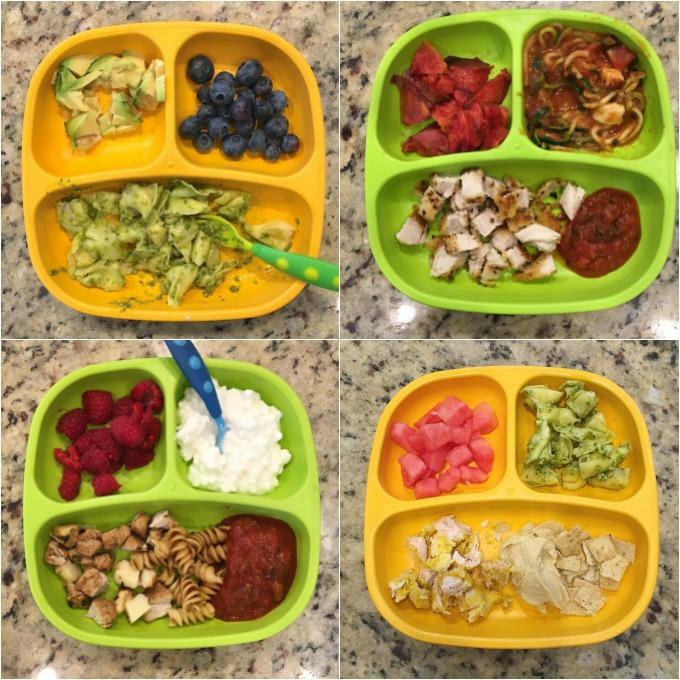 My 2 year old has become a super picky eater! She use to eat everything:( avocado even first food. Now, I’m struggling any advice? I love the recipes you posted and I actually use to make a lot of those for her. Now she won’t eat any. keep trying! 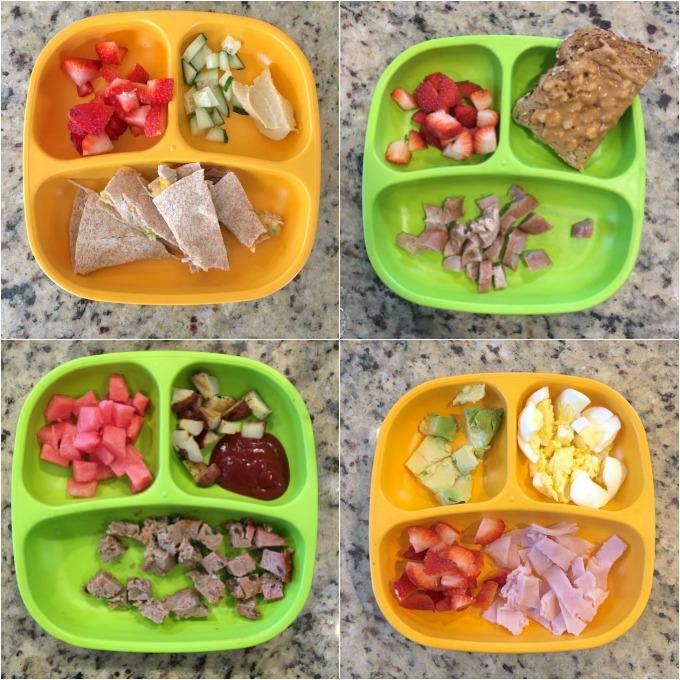 picky eating as toddlers is common and normal. continue to serve new foods, not just her favorites. limit snacks. serve new with familiar. continue to try different preparation methods, sauces, dips etc! Are the pumpkin yogurt bars homemade or storebought? Can you provide the brand or recipe? Thank you! Hi! Thank you for this post! 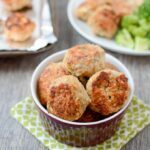 Are the chicken sausages homemade or store bought? storebought! 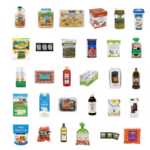 i look for brands with simple ingredients and the lowest sodium i can find. Love this post. Thank you for sharing. Question: when you serve butternut squash and sweet potato do you cook it first? And if so, how? yeah. I either roast it in the oven or with sweet potato i just poke some holes in it and microwave for about 5 minutes. Thank you! I will be referring to this often. 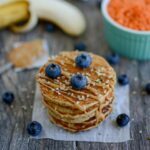 It’s nice to see some healthy ideas!